Published on 17 July 2012. This is the MediCinema in Newcastle’s Royal Victoria Infirmary. I’ve never had the opportunity to venture inside – my job took me to a different hospital before it opened – but I understand that it’s a full scale 56-seat cinema with Dolby Surround Sound and all mod-cons. 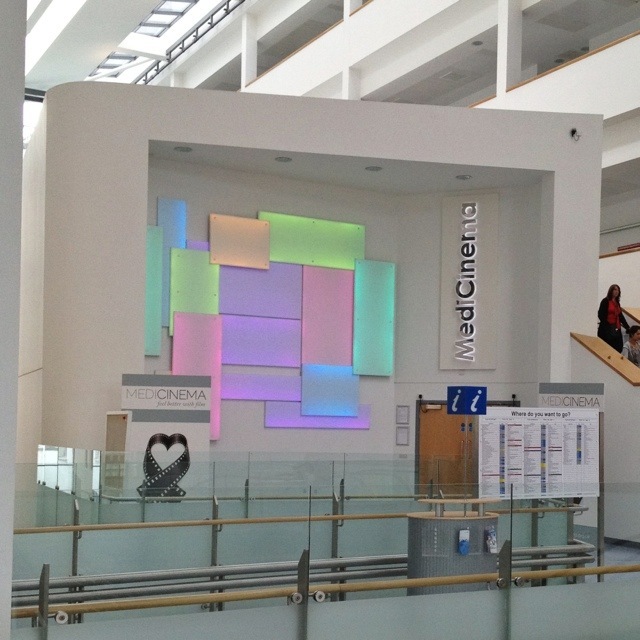 Opened in 2009, it was the first purpose-built cinema within a UK hospital, and gives patients – particularly those in hospital for a long time – the chance to do something a little different to break up the monotony of hospital life. It even has space for people to attend in their beds! The building of the cinema was supported by a number of local and national companies (from Fenwick to Disney! ), and it’s maintained and run in association with the national MediCinema charity. I think it’s a really interesting example of a hospital doing something a little different! This 1,726th post was filed under: Photo-a-day 2012, Art, Medicine.